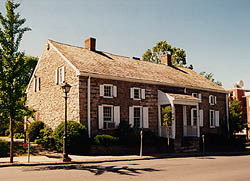 The Hoffman House is a Dutch Colonial style stone house built about 1679. 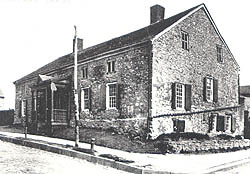 An excellent example of early American-Dutch rubble construction, the Hoffman House displays several of the "prototypical" characteristics of Dutch Colonial housing. Since serious Dutch colonization in America occurred only from 1626 until 1664, and almost exclusively along the Hudson River between Albany and New Amsterdam (New York City), relatively few examples of Dutch colonial architecture exist in the United States. The Hoffman House, built after the British assumed control of New Netherland (New York State), reflects the survival of Dutch building traditions years after English colonists began pouring into New York. The building has remained basically unchanged since its initial construction, and the Hoffman family occupied the house for 201 years, until the late 19th century. In 1908, the property became the headquarters for the local Salvation Army Corps., who due to their programs of social work, spent little money restoring or modernizing the structure, and it fell into disrepair. In 1976, two local entrepreneurs obtained the site and rehabilitated the building for use as a restaurant. Whenever possible, all old usable material was salvaged and restored. The restoration replaced warped and damaged floors, reused original nails, and carefully reconditioned moldings, baseboards, mantels and door paneling. As one of the architectural highlights of Kingston's Stockade district, the Hoffman House vividly displays the long and varied history of the Dutch in America. Hoffman House is located in the Stockade Historic District at 94 North Front Street, at the corner of Green Street. The restaurant is open for lunch and dinner. For more information call 845-338-2626.